Many kids look forward to Christmas: the music, the decorations, the lights, the presents, Santa. For Sam Haworth, Christmas is a year-round affair. “Sam loves Christmas and has a tree in her room all year round,” said Denise, Sam’s mother. Visiting Santa every year is especially important to Sam. A special occasion she anticipates months in advance. Not only did Sam anticipate her annual Santa visit this holiday season, she even saved up her birthday money for a special outfit for the day. “We were out shopping and I turned my back on her for what seemed like just a second and when I turned around she was standing there holding this elf dress and accessories. She had gone around and picked up all the items she felt were necessary to make it work. She knew exactly what she wanted. Sam loves her visits with Santa not least of which because of the amazing volunteers that put on the one-on-one event at the Thompson Center. Sam lives with autism and has been a patient at the Thompson Center for several years. The strides she has made over that time are apparent through her Santa visits each year. 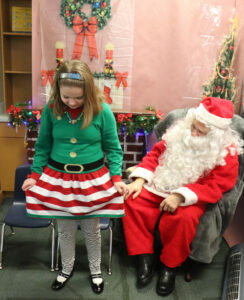 “That first visit years ago, Sam was really shy and timid and it took her a while to warm up to Santa,” Denise said. “She seemed to not know what to do with Santa that first year, we had to encourage her to get beside him and talk to him. Denise says Sam’s hard work at the Thompson Center has helped her overcome a number of obstacles. “She was set up with some amazing therapists, they have helped her with her speech (so she could talk with Santa with confidence), some of her food pickiness. We worked through the steps trying new things like the cookies and hot cocoa so she could make the decision that she doesn’t like hot cocoa. These skills and behaviors have helped prepared Sam for a life of thriving with autism. 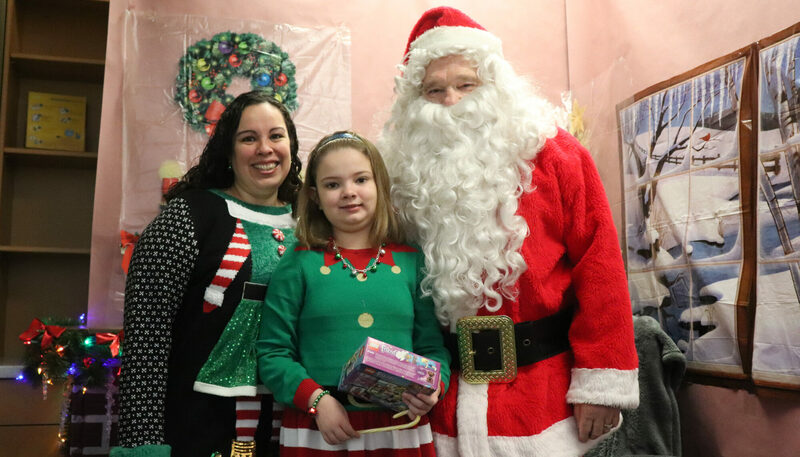 While she may have outgrown her Santa visits by next year, Denise says her experiences at the Thompson Center will always be with her. And it’s impossible for those who will be assisted by “helper elf Sam” in the future to be disappointed either.